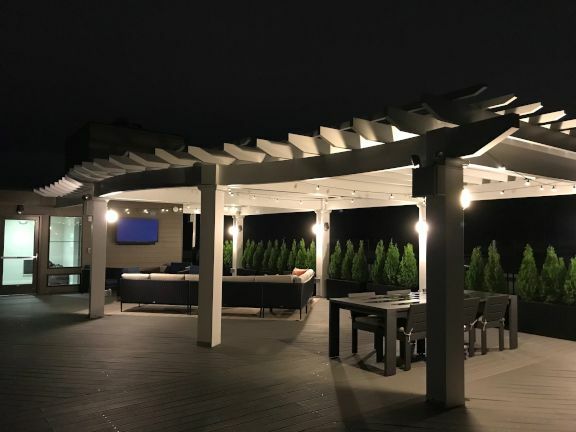 Baldwin Pergolas is the industry leader in the design and manufacture of custom fiberglass, aluminum and cedar pergolas. 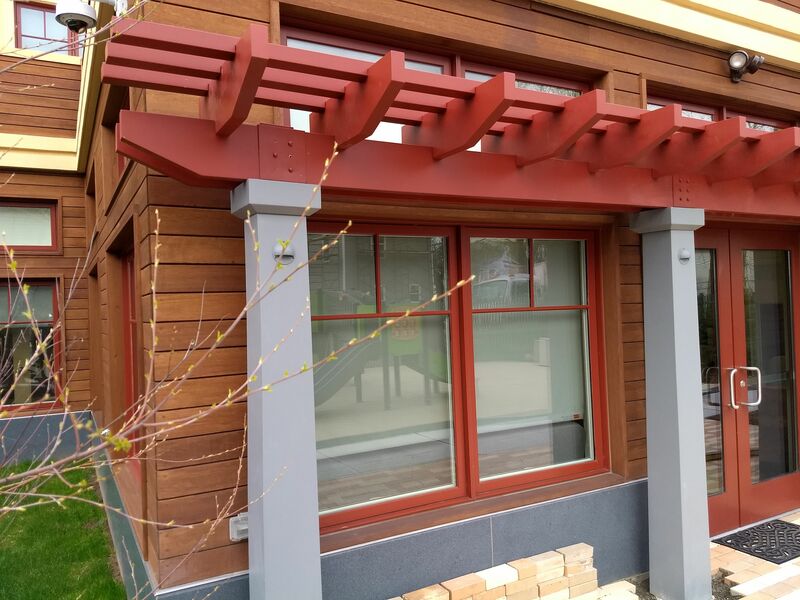 Our professional design team has years of experience and are ready to innovate solutions for even the most complex challenges. We work with architects, builders and engineers from around the country to achieve the impossible every day. 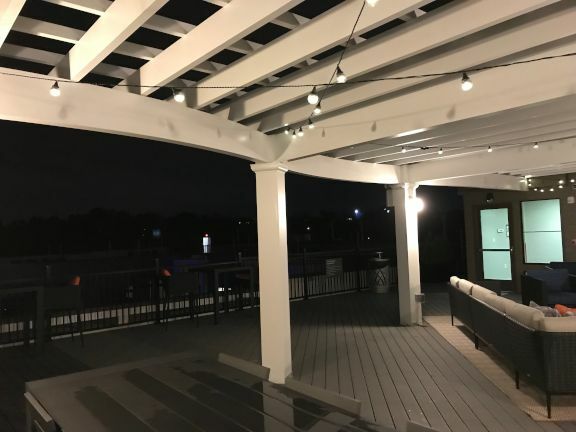 Our unique interlocking notched rafters and purlins provide additional strength and are a feature that sets Baldwin apart from the rest. 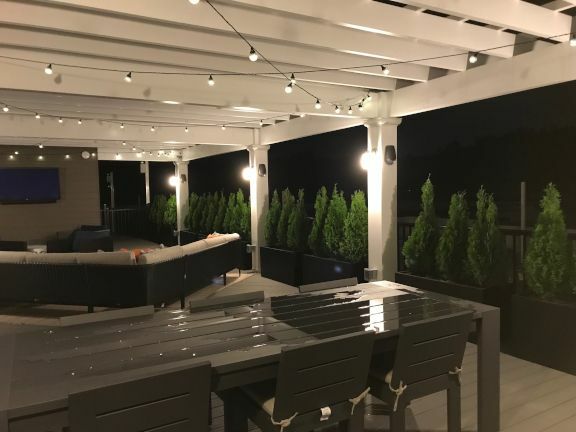 Baldwin pergolas are designed for a clean look and easy assembly with minimal tools and experience. 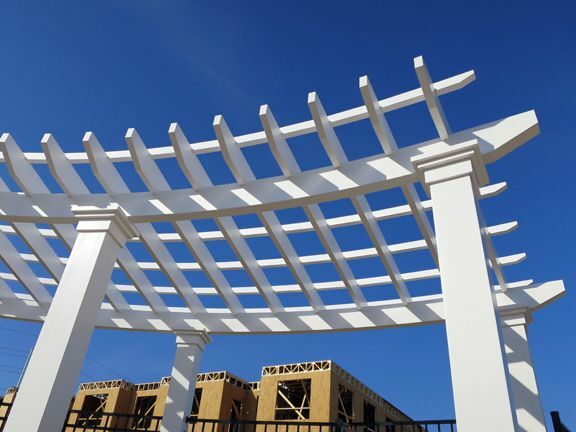 The details matter when designing a pergola and choosing a pergola company. Our expertise and years of experience puts Baldwin a "Notch Above". 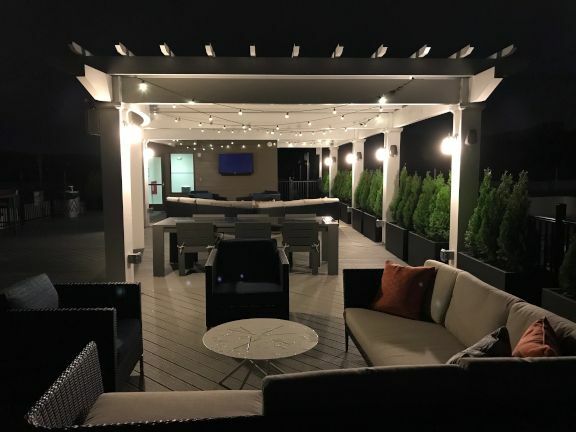 Call us today to get started with your next project. We speak your language! 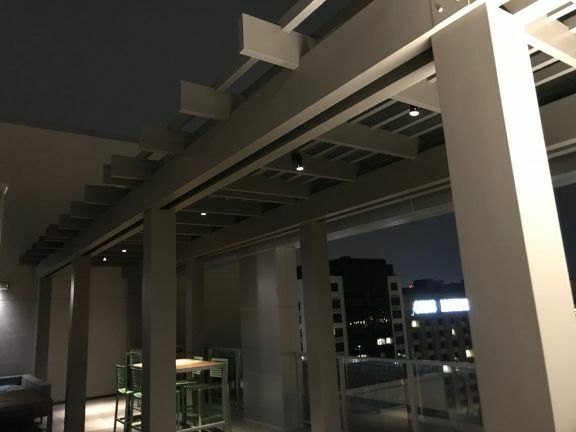 We offer a wide variety of custom options ranging from column style to concealed in-beam lighting. 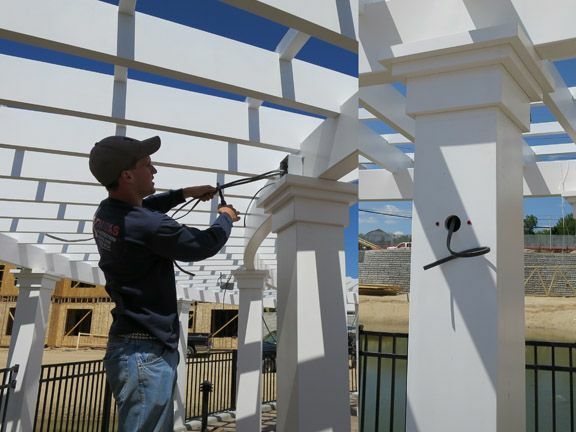 If your latest project requires a highly customized pergola the design team at Baldwin is here to help. Whether during the design phase or on site, challenges always arise and our experienced team is equipped and ready to solve them. We work with architects and builders from across the country to build the impossible every day. 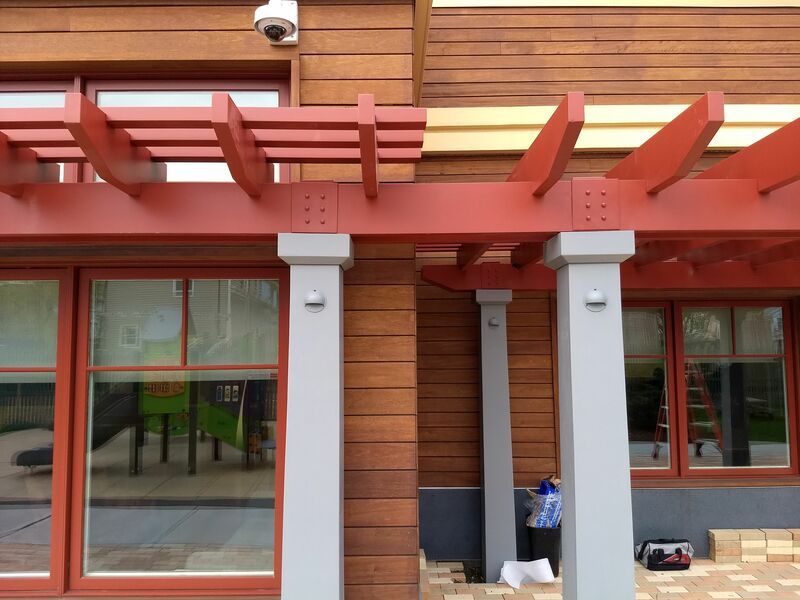 We make the pergola design and approval process easy by sharing our drawings in .DXF and .DWG formats. Architects are free to paste our designs into their drawings for a more seamless and integrated experience. We've got you covered from start to finish. 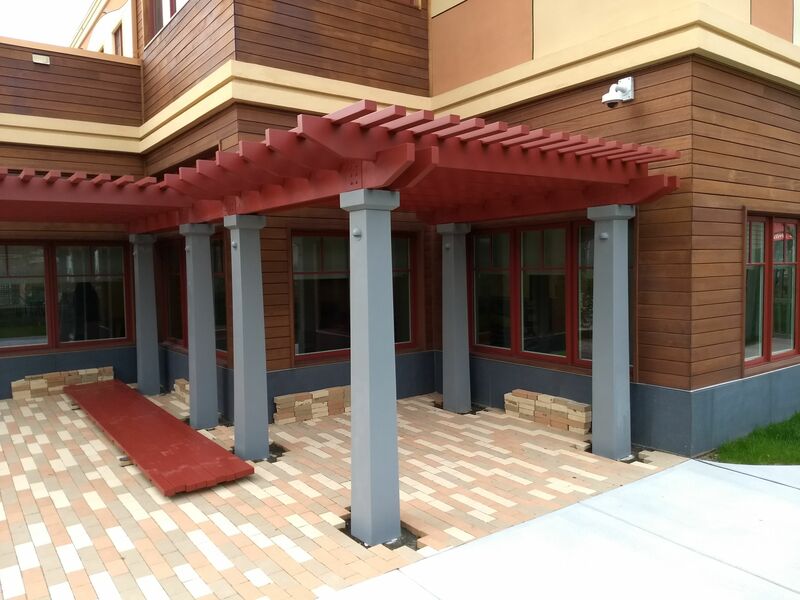 We work with clients from conception to completion on even the most challenging of projects. 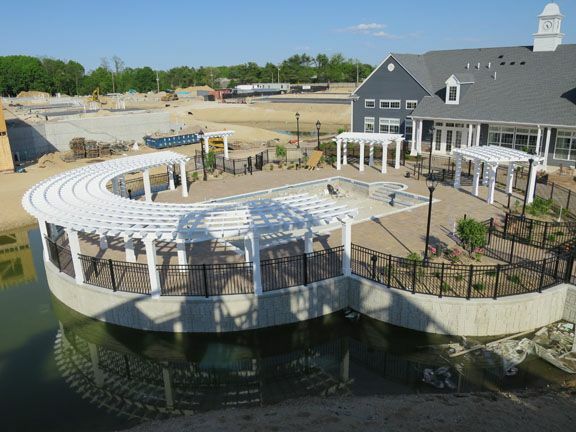 This project required a massive curved pergola and five smaller structures. 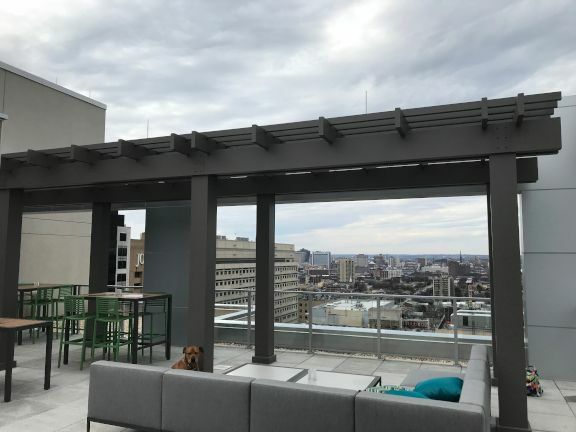 To meet this demand we custom designed and engineered a hybrid aluminum and fiberglass structure. 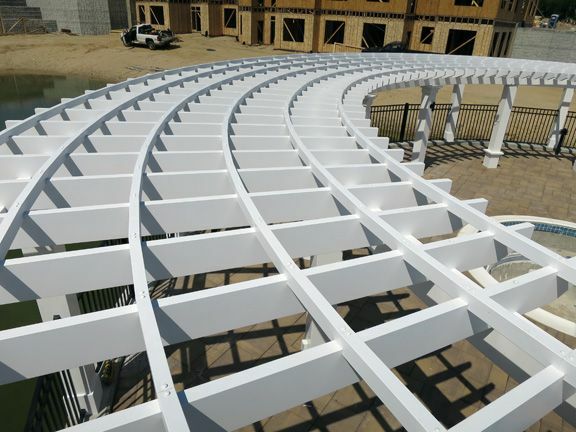 The beams started as 4x12" aluminum extrusions and were stretch bent to an exacting radius. 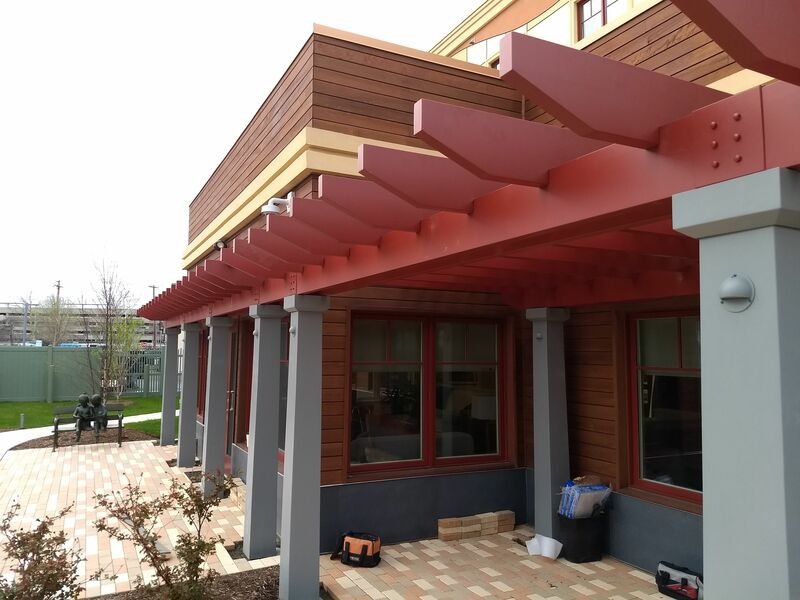 The rafters and purlins were fabricated from fiberglass pultrusions and sprayed with the highest quality PPG industrial coatings. We do healthcare. We've worked on several projects in the healthcare sector, from assisted living to charitable organisations. 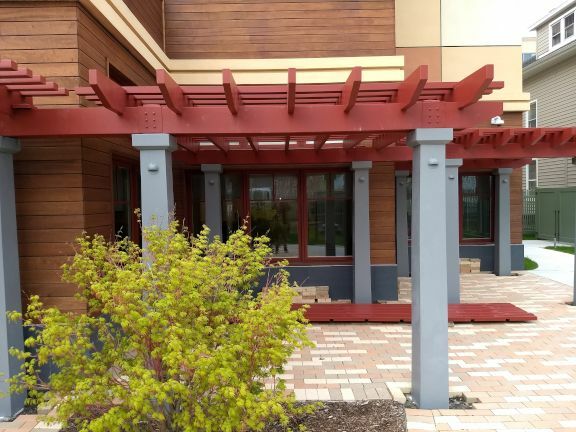 Naturally we were elated when Ronald McDonald House of New Haven, CT approached us for this project. We worked with their design team from start to finish and helped them realise their design goals. 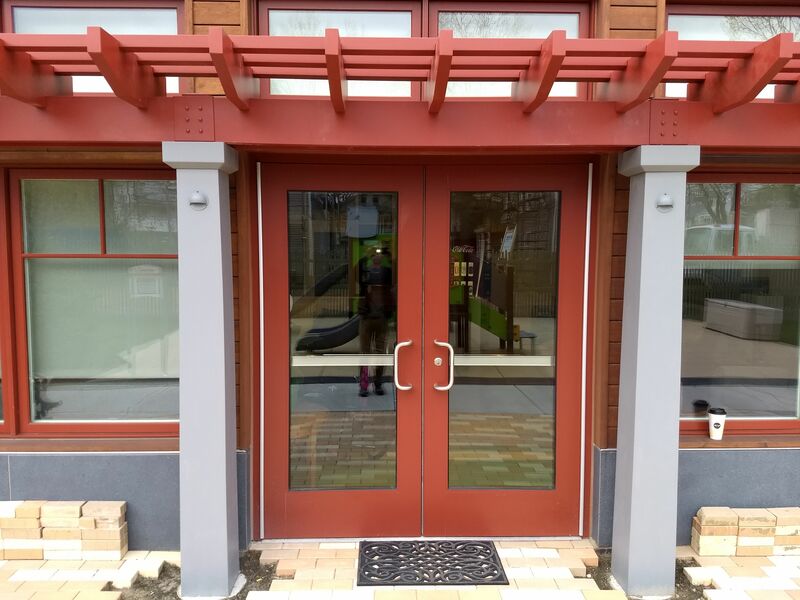 This entryway pergola features a clean contemporary aesthetic and was designed and built with the existing structure in mind. We offer fast quotes and .DXF/.DWG files for architects and engineers to more easily integrate our drawings. We do corporate. 800 Connecticut Ave is home to a number of Fortune 500 companies. We were contacted by their design team with a clean modern design. 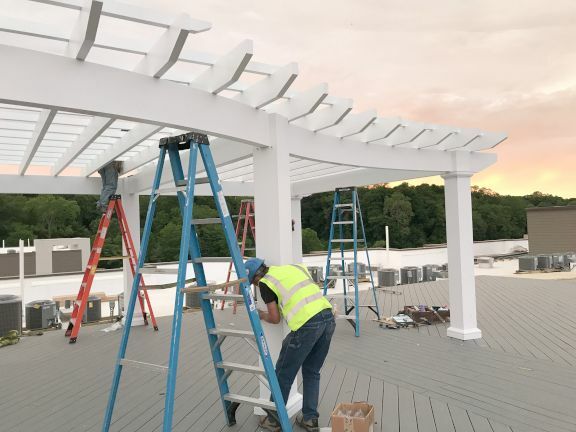 The process starts with the creation and revision of shop drawings, once the drawings are approved our manufacturing crew in Middletown, CT gets to work. 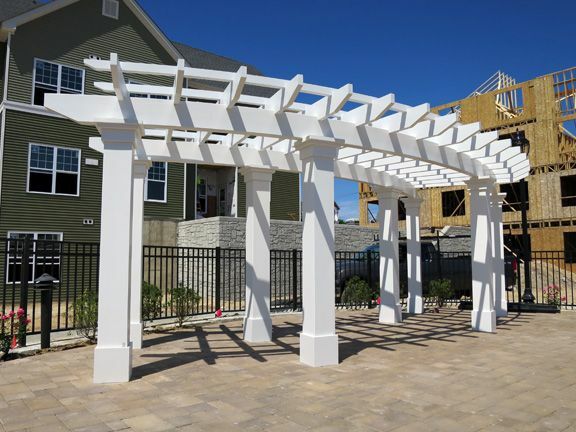 After production is complete our clients have the option of having their pergola installed by a team of Baldwin employee installers. We make it easy from start to finish. We do curves. When this challenging project crossed our desks we just couldn't resist! This beautiful aluminum/fiberglass hybrid is the result of intense collaboration with a demanding client. 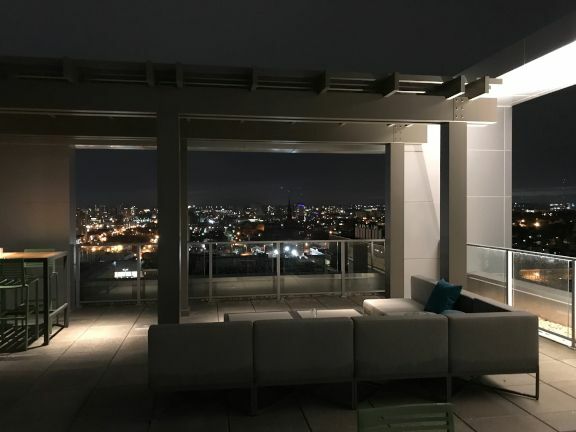 Every project is unique and we take our time to ensure no detail is neglected. 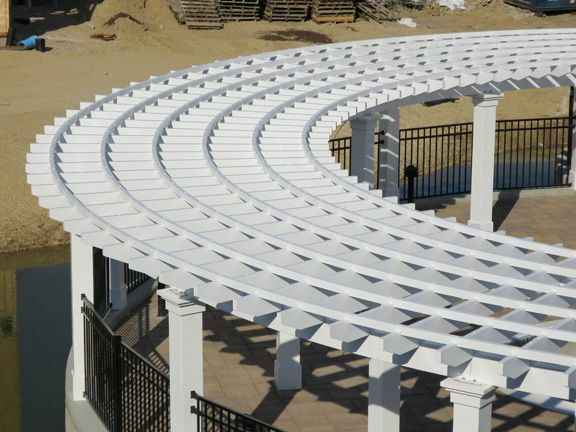 This pergola is constructed with curved aluminum beams and a fiberglass trellis. Our quoting process is fast and easy. Contact us today to speak with a member of our design team. We do hospitality. 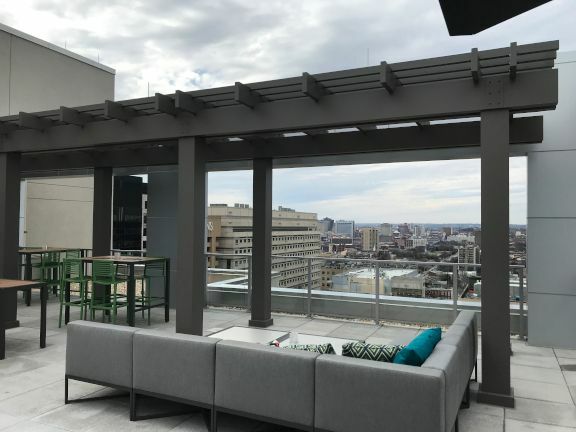 This pergola was built for the Marriot Hotel in Baltimore, MD. It features a sleek modern design and custom paint job. 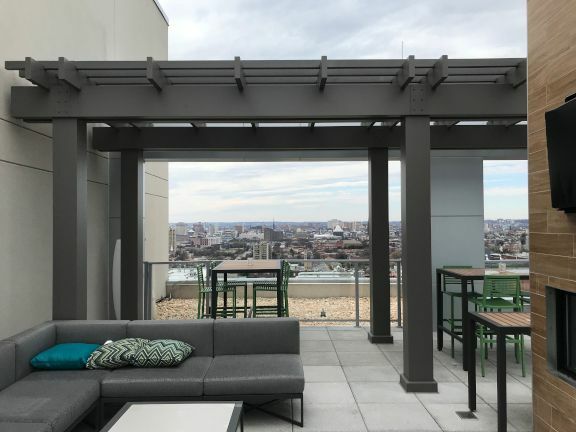 This structure creates the perfect atmosphere for a relaxing rooftop retreat. 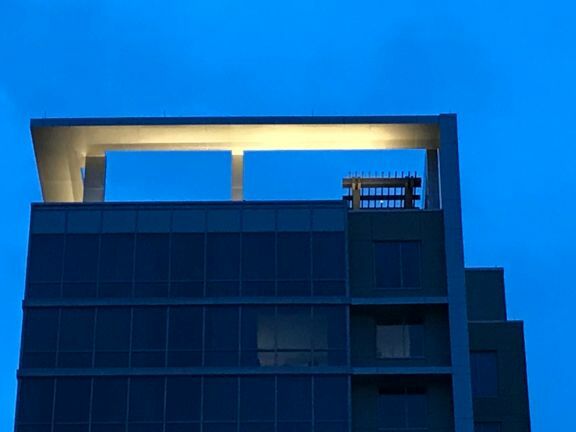 This is just one of a handful of projects we have worked on for Marriot over the years. Contact us today to get a fast and free quote.